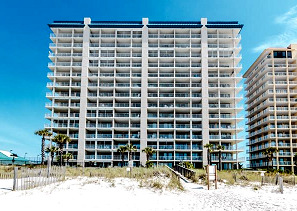 Bluewater condo for sale in Orange Beach Alabama. You won't find any carpet in this updated 3br/2ba condo in Orange Beach! This unit features new rustic driftwood porcelain tile in the bedrooms and living area, new stainless self cleaning stove and stainless dishwasher, new washer and dryer, new bedroom mattresses and bed sets, new antique Hunter ceiling fans, new Breezesta Coastal collection outdoor table, chairs and Adirondack loungers for the balcony, and more! Bluewater condos offers a large indoor pool area with hot tub, an outdoor pool and separate kiddie pool area, BBQ areas, a fitness room, and expansive views of the pristine sugar white beach and sounds of the surf to relax you on your balcony! Close to restaurants and shopping! This unit is currently in a rental program and has a strong rental history!– there’s more, come see!